蒙古彌勒大佛計劃將建立於第一世哲布尊丹巴之聖地The Grand Maitreya Project - 佛子联谊论坛 - 格鲁修学社区 - Powered by Discuz! Mongolia is currently experiencing anationwide cultural re-connection with their spiritual roots of Buddhism. Aftermany years of occupation, 200 brave Mongolian people staged a peaceful protestthat eventually sparked into a nationwide cultural revolution. By 1990occupying forces retreated and Mongolia once again re-gained their spiritualfreedoms. Hoping to re-build and re-connect fully with their ancient culture ofTibetan Buddhism, the Mongolian people have turned to DL for guidance duringthis time. At the heart of the Mongolian people’sspiritual re-connection and under the guidance of a spiritual board led by DLis the Grand Maitreya Project. The Project aims to help further Mongolia’scultural revival by building the world’s largest beacon of Loving - Kindness.At the projects center will be a 177 foot tall statue of the standing MaitreyaBodhisattva. Maitreya is the Buddha, or Bodhisattva of Loving - Kindness.Connected to the statue will be a stupa which will house several interiorteaching and meditation levels, along with holy relics and other artifacts ofthe historical Buddha. Building large statues of Maitreya was anancient spiritual tradition for many of the high Mongolian and Tibetan Buddhistlamas of the past. Many of the Lamas teach that the larger and more beautifulthe statue is, the more people will learn about it, come into contact andbenefit from this. The Project’s intention is that the size and beauty of thisGrand Maitreya statue will bring this sacred symbol of Loving-Kindness back tothe beautiful people of Mongolia and at the same time to the attention of manypeople throughout the entire planet, helping to create awareness for peace onEarth. The statue construction site is located ina place Mongolian people call Heart Hill, just outside of the Mongolian capitalcity of Ulaanbaatar. The statue site will serve as an educational, spiritualand cultural center for the world. The statue site will also featurenon-sectarian & international Buddhist centers representing many differentlineages and traditions from around the world. Making the Project a uniqueplace for all spiritual traditions to come together in peace. Once the statueand stupa are completed, the project will work to help create a culture ofLoving-Kindness for the world. One of the goals of the project is to offer freemeditation training and many other educational services for people of allfaiths and backgrounds. The Project is being conducted under theSpiritual guidance of DL, leader of Mongolian Buddhism HE Khamba Lama GyabjeChoijamts Demberel, Lama Jhado Rinpoche and Venerable Thupten Ngodup Oracle. The news is that HH D L is going to visit Mongolia within the next week and he will be enthroning the 10th Jebtsundamba Khutughtu who was recently confirmed to have been reborn in Mongolia. With a 177-foot tall statue of the Buddha of loving kindness at the heart of it all. Since Mongolia’s transition from communism to constitutional democracy in 1990, the East Asian country has worked to revive its centuries-old Buddhist tradition. Now, a major Buddhist site is in the works under the spiritual guidance of the DL and organizers say it’s bound to become a global hub for training and meditation. The Grand Maitreya Project is being spearheaded by artists, developers, spiritual leaders and more in Mongolia and in the United States. 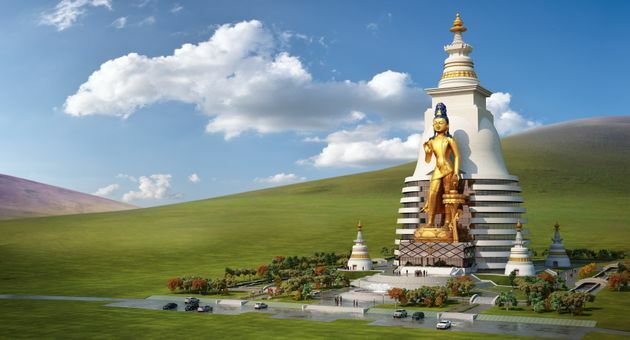 The site will feature retreat and meditation facilities and Buddhist educational centers, with a 177-foot tall statue of Maitreya Bodhisattva, the Buddha of loving kindness, at the heart of it all. “The intention is that the size and beauty of this statue will bring this symbol of love to the attention of many people around the world,” Michael Fouts, executive director of the U.S. branch of the project, told The Huffington Post. After decades of rule by an oppressive communist government, which destroyed hundreds of Buddhist monasteries, burned ancient texts and executed thousands of lamas, Mongolia transitioned to a constitutional government with a parliament and an elected president in 1990. With this change came the opportunity to revive the country’s Buddhist community, to which end the Grand Maitreya Project aims to serve. The project is currently under construction at a Buddhist holy site known as Heart Hill near the Mongolian capital city of Ulaanbaatar. Heart Hill is believed to be the place where a revered Jebtsundamba Khutuktu, or leader of Mongolian Buddhist, lived some 300 years ago, Fouts said. “It is very special and auspicious for the Mongolian people to build symbols of love and Buddhist centers on this site, as well as to receive teachings here,” Fouts said. The 177-foot tall statue of Maitreya Bodhisattva is currently 35 percent complete, Fouts said, and project directors are working to raise funds for the remainder of the construction. In addition to the DL, spiritual leaders helping advise the project’s directors include Khamba Lama, or senior lama, Gabju Demberelyn Choijamts, Tibetan Lama Jhado Rinpoche and American Buddhist teacher Robert Thurman, who serves as president of Tibet House in New York City. “The whole concept is one we support — a free expression, forward- and outward-looking and hopeful for the future, of the Buddhist roots of Mongolian culture,” said Thurman’s son, Ganden, in an email to HuffPost. 177-foot-tall statue of the standing Maitreya Bodhisattva will be built in Mongolia under the spiritual direction of the DL. The project is set to be completed by 2018. The project aims to rebuild Mongolia’s ancient culture and history of Tibetan Buddhism, starting with the statue of the bodhisattva of loving-kindness, according to the project’s website. The statue is meant to act as a beacon of peace, following Mongolia’s complicated history of communist occupation and anti-Buddhist campaigns. The Grand Maitreya Project itself is indicative of a cultural divide finally being bridged. A stupa will be connected to the statue, housing interior teaching and meditation levels, holy relics and other artifacts. The DL has selected sacred relics of the Buddha from his personal collection to be enshrined inside the Maitreya statue. GMT+8, 2019-4-23 00:01 , Processed in 0.139205 second(s), 17 queries , Gzip On.